After the scant .35 that separated the first and third place corps at the DCI Southeastern Championship in Atlanta a week ago, a question on everyone's mind was whether the DCI Southwestern Championship in San Antonio would offer any clarification as to who had momentum heading into the Indianapolis/Denver and Stanford/Phoenix weekends of DCI major events, all too soon followed by the World Championship week in Pasadena, Calif. this August. This anticipation was only further piqued by Blue Devils and the Cavaliers breaking 90.0 on the same night two evenings before the San Antonio show, tying (in two different shows) with a 90.400. The answer is: Well, we're still not sure – at least for now. Blue Devils (1st-91.350) spread of .425 over the Cavaliers (2nd-90.925) seems like a monstrous opening up of the scores, compared to the microcosmic spreads of the previous weeks. But the Cadets (3rd-90.250), slipping to third from second place in Atlanta, are only 1.1 back of Blue Devils, though that now seems like a chasm compared to the spreads to which we are used. Blue Devils once again took Visual Performance and Ensemble and added Music Ensemble honors, plus total General Effect (GE) though placing second in both GE captions. 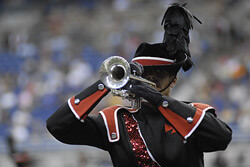 Brass, fifth in Atlanta, moved up to fourth. Color Guard also moved up one position from Atlanta, to fourth. Percussion, second to Phantom Regiment, put a spread of .55 over the Cavaliers' line. The Cavaliers again took Color Guard and General Effect Visual captions, but again placed fifth in Percussion, that .55 spread behind Blue Devils (and .7 under the winning Phantom Regiment line) being the corps' Achilles Heel, especially when the stakes are so high at the top and the margins of total score differentials so tight. The Cadets captured first place in General Effect Music, but took fifth in Color Guard and fourth in Percussion. 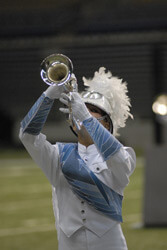 Taking fourth place in Brass in Atlanta, the line moved up to second in San Antonio. Bluecoats (4th-89.075 with a .2 timing penalty) moved up from fifth in Atlanta, passing up Phantom Regiment. 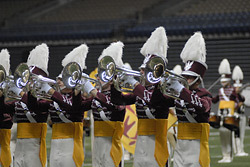 The corps again took first in Brass, but Color Guard slipped a position to seventh, a full 1.4 under the Cavaliers – the spread being enough to keep the corps out of a top three position. (Though to be realistic, the Cadets' Color Guard placement of fifth might not change that dynamic.) Carolina Crown (5th-87.925) has every right to be proud of its first victory over the Phantom Regiment. Second place in Color Guard, .7 over Phantom's guard score, accounted for most of the spread over the Rockford corps. Crown's next highest placement was fifth place finishes in three captions, followed by sixth place in three other captions. Phantom Regiment (6th-87.375 with a .3 timing penalty) might be reeling from dropping from 4th place in Atlanta, but the percussion section still has a commanding lead over many other of the top corps, though just .15 over Blue Devils. Eighth place in Visual Performance, seventh in GE Visual, and sixth in GE Music and Music Ensemble are current drawbacks. (The GE Music, Visual Ensemble and Color Guard scores were the same as in Atlanta.) Santa Clara Vanguard (7th-86.250) went from being just .2 under sixth place in Atlanta to 1.125 down in San Antonio. The highest caption placement remains GE Visual, in which the corps placed fourth. After sixth place in Visual Performance, all other caption placements were seventh or eighth place. Being 1.65 down in Percussion to Phantom is the difference between placing in the top six and being in the bottom six. Boston Crusaders (8th-84.500) have opened up a substantial lead over Blue Knights of 3.2 after being just .675 above the Denver corps the week before. All captions for Boston were eighth or ninth. Blue Knights (9th-81.300) placed ninth or 10th in all captions. Huge news was the Academy (10th-78.975) coming into its first really big show of the season and knocking off Colts and Glassmen. The corps' highest placement was ninth in Visual Performance. Twelfth place in Visual Ensemble and Color Guard still gives lower placing corps some hope to move up. Colts (11th-78.825) took ninth in Visual Ensemble and Glassmen (12th-77.900 with a .9 timing penalty) took ninth in Color Guard. In the afternoon prelims competition, there were a few notable things that jumped off the recaps. Blue Knights (who didn't have to perform in the afternoon show in Atlanta) had a comfortable 2.375 spread over second place. The second, third and fourth place corps advancing into finals (The Academy, Colts and Glassmen) scored 81.525, 81.424 and 81.325, respectively. The Academy took first in Visual Performance and second in Visual Ensemble, but placed sixth in Color Guard, 1.3 under the top scoring Glassmen guard. Blue Stars (5th-80.050) once again the corps that just missed finals, (moving ahead of Spirit from JSU since Atlanta but falling to the Academy, a corps that wasn't in Atlanta), placed eighth in Color Guard, 1.5 under Glassmen. Add that 1.5 to the corps' overall score and they would have placed second in the afternoon by .025. The corps took second in Percussion from one judge and eighth from another. The corps made the largest point gain from Atlanta of any of the corps that were in both prelims shows, adding 4.85 to its score, well above the average prelims point gain of 3.62 between the 10 corps in prelims that were in both prelims shows. Spirit from JSU (6th-79.200) slipped out of finals by 2.125 despite adding 3.7 to its show from Atlanta prelims. In fact, only three of the 10 corps in both Atlanta and San Antonio prelims had point gains under that 3.62 point average; Colts (2.8), Southwind (1.875) and Pioneer (3.0). Because Pacific Crest was not in Atlanta or San Antonio somewhat complicates figuring out which corps are currently favorites for making the Semifinals cut at the World Championships in Pasadena. 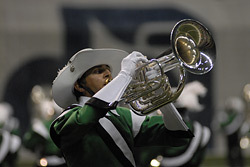 The corps had been scoring above Madison Scouts on its first tour. Crossmen (7th-77.750) passed up Madison Scouts (8th-76.625) from the Atlanta prelims, but stayed in 7th due to the addition of the Academy. Madison Scouts (8th-76.625) have solidified their shot at semifinals, currently sitting in 17th if one factors in Pacific Crest higher up. Cascades (9th-74.825) were seventh in Color Guard, but 12th in Percussion. If there was no seismic shift between now and the World Championships, Cascades might be looking at a shot at Semifinals, as the corps is currently sitting in 18th (factoring in Pacific Crest higher up). Plus, the corps reversed its loss to Southwind in Atlanta. 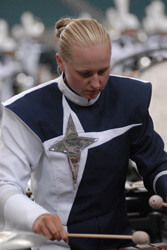 Troopers (10th-73.950) also passed up Southwind from the Atlanta show. It will be interesting to see if Southwind (11th-73.225) can reverse its slide since Atlanta, when the corps placed above both Cascades and Troopers. Mandarins (12th-72.775) and Pioneer (13th-69.075) rounded out the Division I contestants in the San Antonio afternoon prelims. All corps will not face off head-to-head like they did at the Alamodome again until the World Championships in Pasadena Aug. 9-11. Both the afternoon and night shows in San Antonio offered many interesting dynamics to watch until then.